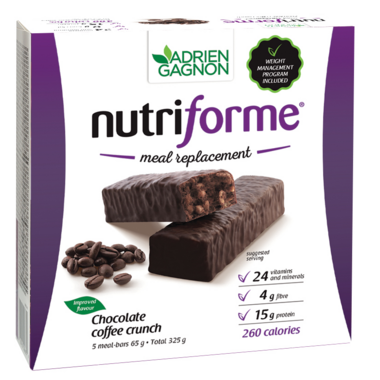 Adriene Gagnon Nutriforme Bars are a complete meal substitute supplying essential vitamins and minerals for proper metabolism. They are useful in weight reduction onl as part of an energy-reduced diet. To replace a meal when in a hurry. As a protein rich snack for active people or for those who train. Useful in weight reduction only as part of an energy-reduced diet. Replacing 1 or 2 meals daily with a Nutriforme bar helps reduce the number of ingested calories and promotes weight loss. For optimal results, follow the Nutriforme Diet Plan (complete information provided in each package). If you are diabetic, you can take this product, but only in order to replace a meal, and you will have to take in account the amount of carbohydrates that it provides. If you have food allergies, note that our bars may contain oat (gluten) and are made in facilities that also prepare nuts and seeds. Good bars, only 4 stars because this is my least favorite taste.